Whom You Know: Flavors of Lonato Hawaiian Red Salt Seasoning Recommended by the Peachy's Pantry Panel of Whom You Know! Flavors of Lonato Hawaiian Red Salt Seasoning Recommended by the Peachy's Pantry Panel of Whom You Know! Salt is something that none of use can live without, and it adds such wonderful flavor to our foods. Until now, I never realized that salt could come in liquid form. Flavors of Lonato has created a wonderful Hawaiian Red Salt Seasoning that tastes great. One of the benefits, besides the taste, is that when using this liquid salt, less is required to achieve the same level of flavor produced by regular salt. Also, its red color is due to its volcanic origin and indicates the high levels of iron that are present in the seasoning. I made fish with couscous and sprayed a bit on the side of my plate for dipping my food. It was a great idea! Liquid salt? If somebody told me that such a product existed, I would have chuckled and thought that they were pulling my leg. However, not only does such a product exist, but it's also quite excellent and up to our standards at Whom You Know! Flavors of Lonato, a company dedicated to importing top-quality northern Italian food items to the United States, has a line of "Sali Liquido" (Liquid Salt), and it's fantastic! I recently tried the Alaca salt, which is a traditional Hawaiian table salt named for a red clay of volcanic origin. True to its name, it has a reddish hue, which makes it a visually stimulating addition to any dish, in addition to the terrific flavor it imparts. The recommended amount of liquid salt is 4 times less than that of typical table salt, so you get the same amount of flavor from far less product - much healthier! I used it to flavor chicken, and was amazed at how much flavor came from such a small amount! It was truly remarkable! This will definitely be a staple in my kitchen from now on! What better way is there to wind down a day than with some grilled lobster tails? 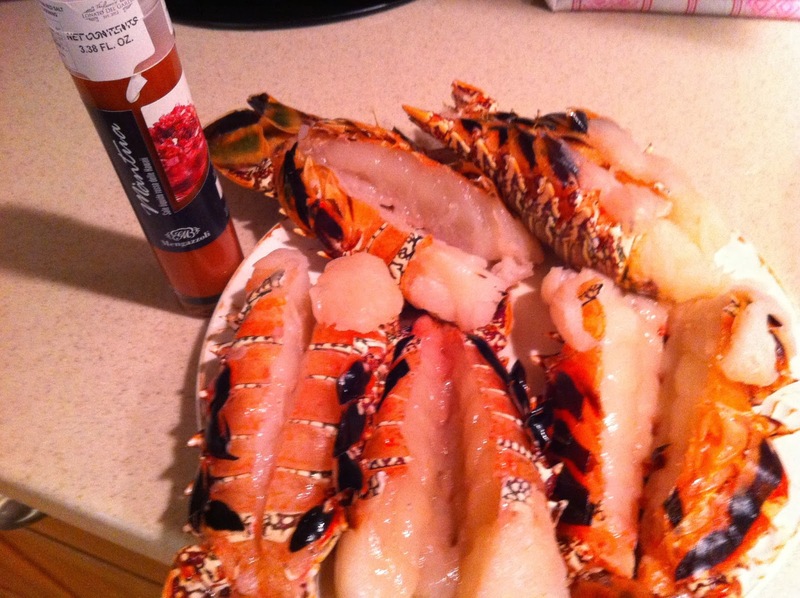 Even the freshest of shellfish can use some well-placed seasoning and I decided to sprinkle my lobster tails with Lonato Del Garda’s Màntua Hawaiian Red Sea Salt. The liquid red salt is perfect for coating all of the hidden nooks under the split shell. As the tails blacken slightly on the flesh side, I flip them and add some melted butter. The result is a perfectly juicy lobster tail. Hawaiian Red Sea Salt is a shellfish lover’s dream. It is at once powerfully flavorful without the strong tartness of some granulated sea salts. Liquid salt?!?!? I put salt on pretty-much everything, so I don’t know WHY I haven’t found this sooner. The Hawaiian Red Salt Seasoning is a fantastic highlight for any dish that needs a little extra flavor. I tried it on sunny-side up eggs, and it was delicious. I won’t be going back to regular salt on my eggs anytime soon. The flavor is salty, but also has a bit of a “mineral” flavor to it, all while managing to be subtle and not overpowering. I’ll be trying this on all my dishes. Flavors of Lonato del Garda was started by two very dear friends, each on the opposite side of the great pond. As the world has transformed from what we know as round, separated only by distance and culture, these friends took an idea to bring a small part of Italian culture with its rich history and passion for healthy cooking to a world that is now flat. With trust and determination, this friendship over the years inspired the idea which you now see before you: “Flavors of Lonato.” Our idea, a little taste of Northern Italian fare, is represented by the finest products from the small villages exclusive to the Garda region of Italy. This region is known for the exceptional high quality of products produced by small family owned growers with over a millennium of expertise that has been passed down from generation to generation. “Flavors of Lonato” now proudly brings this rich historic culture to the US consumer for all to enjoy! Is it possible that we have brought food down to the lowest common denominator? Much of our food is processed, pasteurized and homogenized until it becomes bland and indistinguishable. Many of us have come to accept mediocrity, telling ourselves these products are “good enough” because that’s all we have come to know. But when you’ve tasted food created from an artist’s own hands, made with patience and love, with all of it’s complexities and cultural identity intact, good enough is no longer part of our vocabulary. Great food makes life worth living, even if it is just for the sweet taste of grapes, a bite of cheese that is so good there are no words to describe it. Balsamic vinegars that have been lovingly created and aged for 25 years or a piece of freshly baked bread dipped into a fresh press olive oil. Great food brings people together to share the experience of a region, culture and the lives of those who thoughtfully grew it. Good enough can never do that, and Flavors of Lonato del Garda, Inc. (“FLG”) never accepts “good enough”. In recent years, a controversy has been arising regarding the labeling of food items as a “Product of Italy” or substandard olive oil as “Extra Virgin”. When a product is labeled as a “Product of Italy”, most people assume that this means the product was grown, processed, packaged and shipped from Italy but the product itself could have been purchased anywhere and shipped to Italy for processing. By the same token, if a label of olive oil reads “Extra Virgin” it does not mean that it has been processed and prepared according to the strict guidelines established to ensure the quality that the label implies. FLG standards guarantee that our products are grown, processed, and shipped from Italy only and that they are of the highest quality and standard because “good enough” is not good enough! Liquid Salts: Our line of liquid salts was created for its practical usage and important health features. The recommended dosage is four times less than that of common table salt. Use it to season, flavor and creatively decorate your favorite dishes. We offer three varieties of the liquid salt: Red Hawaiian Alaea Liquid Salt, Black Hawaiian Lava Liquid Salt and Liquid Marine Salt. The Red Hawaiian Alaea Liquid Salt is derived from a red clay of volcanic origin with an iron content. It tastes slightly of hazelnuts and is used on grilled meats and roasts and salting fine herb-butters. The Black Hawaiian Lava Liquid Salt is derived from black marine salt from the Island of Molokai which is dried on volcanic soils and processed by local artisanal craftsmen. It is rich in elements and active carbon which endows it with a characteristic color and detoxifying properties. The taste is slightly bitter and smoky. It is ideal in preparation of white and red meats on the barbeque. It is also excellent with salmon, caviar, vegetables and salads, sushi, or simply on plain pasta. Liquid Marine Salt is sea salt in a liquefied form. It is commonly used for cooking to enhance the flavor of many foods. It is healthier as the recommended dosage is lower than that for crystal salt. These salts are unique to our company.